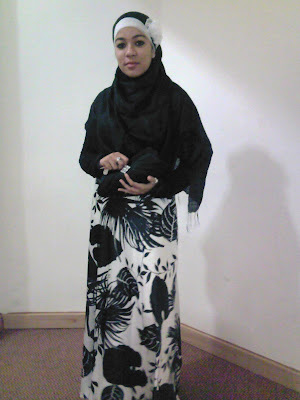 Satin maxi dress: Debut at Debenhams; black bolero: Krisp; earrings: Accessorize; black clutch: Accessorize; cream shoes: Unze; hijab: silky black pashmina and white chiffon underscarf which was used to create a flower on the side. I like to wear a lot of maxi skirts and dresses in funky prints or colours. With the dress I tend to wear lightweight opaque boleros for when it's hotter, and long sleeve tees for the winter, pretty much same with the skirts, but, a little sneaky trick I have is to get a lot of the longer tank tops (which are in fashion right now) in different colours and team them with boleros/shrugs for the summer; saves me from burning! She looks BEAUTIFUL, mashallah! I love it how everything matches, but it is not OTT. She looks v.elegant. GASP! This is breathtaking! The color scheme, the design, the coverage - everything as flawless as humanly possible masha'Allah! I'm usually not one for black-and-white but this looks great! It's very stylish, I love it! Especially the headscarf play on color and the flower. It gives the outfit a Spanish feel.